3 Does Mysticism Have a Common Core? 4 Does Mysticism Have an Objective Referent? 5 Can Language Describe Mystical Experience? 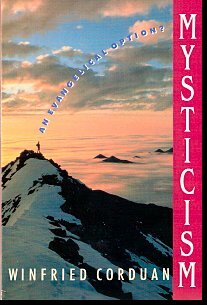 Winfried Corduan, Mysticism: An Evangelical Option?, Zondervan Publishing House, 1991. In this book I am reclaiming the term mysticism for evangelical Christianity. Mysticism is a controversial topic that all too frequently receives one-sided coverage. On the one hand there are many enthusiasts who are willing to defend mysticism at almost any cost, including sacrificing logical and theological integrity. On the other hand there are philosophers and theologians who see mysticism as not much more than an evil to be stamped out. Both attitudes are due primarily to the fact that the word mysticism has been hijacked over the last century and a half so as to become pretty much synonymous with a theosophical unitary experience. Infatuated with the claims coming out of South and East Asia, Western scholars, beginning in the nineteenth century, have championed experiences in which a persons recognize their oneness with God, the universe, and everything. Such an experience, they tell us at length, is beyond words and concepts, and, thus, cannot be spoken about. In their descriptions they emphasize its indescribability. Although the experience is non-verbal, it displaces the authority of the Word of God. The advocates point to a startling unanimity of the experience among mystics throughout time and around the globe, a unanimity that maintains itself by calling itself true mysticism, and declaring everything that differs to be inauthentic. It didn't used to be that way. In contemporary discussions, the view that I advocate in this book has been ccalled idiosyncratic. In one sense this judgment is accurate because it steps out of line with the currently common reductionism. In another sense, though, I am trying to take us back to recognizing that mysticism has many meanings and comes in many different forms. There is no good reason why the theosophists should have the last word on this subject, or better: that they should have the last definition of this word. There are many forms of mysticism, and the theosophical version--despite its conceptual imperialism--is the least defensible of them all. There is a form of mysticism taught in the New Testament, namely the fact of our direct relationship with the infinite God, who indwells us. This is a mysticism that does not require an ecstatic experience and does not constitute a separate source of revelation, but is a reality that anyone who knows Christ as savior can enjoy.